Every Los Angeles job includes a FULL INSPECTION of your property, followed by humane Opossum removal services that fit your specific situation. Forget your Maid! We can clean up & sanitize Opossum poop at your Los Angeles home or building. Need new insulation? We can do that too. This saves you time & money. We can help with protecting your Los Angeles property against future Opossum invaders. We use the latest techniques available & do all is at a great cost too. Urban Wildlife Trapping Experts always approaches every Opossum job humanly. When it comes to Opossum Removal, we offer Humane Opossum Trapping & Removal Services in Los Angeles. Are you hearing opossum noises in your attic? Or have opossums destroying your backyard? Or maybe opossums got into your crawl space? Yes, opossums can become a pest. Tired of dealing with opossums? If that is you, then my opossum control company in Los Angeles can help solve your opossum problems for good. We have the experience and know how to make your property free of opossums. Our experts only using smart, humane and efficient methods that will get rid of your opossum issues. Los Angeles opossum removal requires qualified and knowledgeable experts. If you own a home or business and have opossum problems, then you can rely on our Los Angeles opossum removal experts. Some people refer to this service as opossum pest control or Los Angeles animal control or even opossum exterminators. 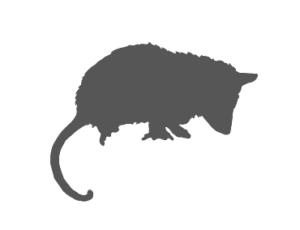 We specialize in professional opossum trapping and opossum control management, and we are not regular insect pest exterminators. We are Los Angeles best opossum trappers. Real Trappers get Dirty!. Urban Wildlife Trapping Experts strives to deliver the best in quality for opossum removal services. We offer low-priced opossum control services, and educational knowledge and tips for opossum prevention for Los Angeles. We will beat any local price quote on opossum trapping, removal or dead opossum removal services in Los Angeles County. If you are hearing opossum noises in your attic or walls, please don't hesitate to call us at 1-844-698-7277. While many people enjoy feeding, seeing and living near opossum, there are times when wild opossums may come too close and create a nuisance. Los Angeles opossum can cause home and property damage or inflict injury on livestock, pets or people. We witness daily on how opossum can destroy yards, soffits, vents, screens and wiring seeking shelter in the structure of your L.A. home or building. From opossums digging in the yard to opossums in the attic having cute little babies. Opossums can also cause over millions of dollars worth in damages to property owners nationwide. We know from firsthand experience that opossums do significant damage to properties in Los Angeles. opossum are leaving behind urine and feces which can become a health hazard to you or your pets. Call Us Today! for Opossum Removal Services in Los Angeles. When this happens, many property owners wish to have the pesky opossums trapped and removed by Urban Wildlife Trapping Experts in Los Angeles County. We know how to get rid of opossums in your backyard or attic.